French consumer company Withings has been central to the activity tracking and health markets for some time. It might not be as popular as the likes of Fitbit, but it has produced some winning devices in the past. 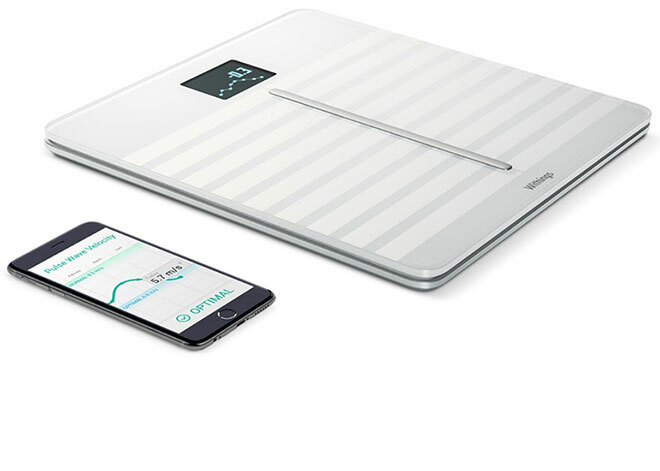 And now Withings launched new Body Cardio wireless scale, which aims to analyse your weight, fat, muscle, water and heart health and take the pain out of tracking your bodily fluctuations. The new Body Cardio scale has a sleek new premium look. If Apple made a bathroom scale, it would definitely look like this one. The Body Cardio scale is available in a white version and a black version. The scale is 12.8 x 12.8 x 0.7 inches and top of the scale where you stand is made of a thick tempered glass slab, along with a divider strip in the center and a white on black display at the top. One unusual feature is that the new Body Cardio runs on a rechargeable lithium ion battery instead of a handful of AA or AAAs. A USB charger is also included, but not an outlet brick, suggesting you plug the scale into your computer. The scales have Bluetooth and Wi-Fi for connecting to the Withings Health Mate app for iOS and Android. The Health Mate app is where you access most of the data. The scales come in 2 versions: with and without PWV measurements. The new Withings Body Cardio comes in either white or black, costing £140. The Withings Body, without PWV measurement, costs £100.